The world of french automaking was a small and incestuous one in the early years of the century, when one of its chief players was fernand charron, a former bicycle racer who was part of the panhard et levassor team that won the first gordon bennett cup race in 1900. The following year he and fellow panhard racing drivers leonce girardot and emile voigt formed cgv. Its first cars are remembered for headlights that turned with the front wheels. Top speed of about 43 mph engine typedrivetrain: Side-valve, inВ¬line 4-cylinder displacement 2,412 cc (2.4 l) power rating 22 hp chassis: About 2,425 lbs. Musical chairs cgv was sold to british interests in 1906. The company and its cars were renamed for charron, but he soon left to direct clement-bayard for his new father-in-law, adolphe clement, formerly chairman of panhard. However, charron had a financial falling-out with clement and walked out to establish in 1912 the alda marque whose models resembled charrons. dashboard radiators meanwhile, under the direction of a belgian, georges koenigswerther, charron was able to recover from a poor 1908 to sell about 700 cars in 1909. These ranged from a 1.2-litre two-cylinder model to a 3-9-litre, six-cylinder one and included the midsized 2.4-litre, four-cylinder type x. Furnished with a dashboard radiator, these cars resembled renaults. 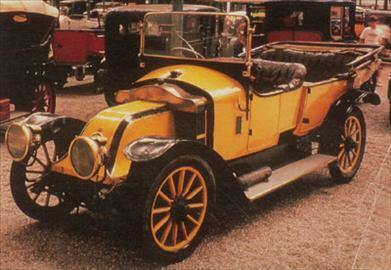 The most popular 1909 model was the type x in spite of its antiquated chain transmission, which was replaced the following year. Charronspopular type x was a midsized model. This one is a torpedo, the name then given to open touring cars with an unbroken line from hood to rear.